This year, I have invested a lot time in making non-fiction reading fun. My students loved the earlier ones I made about spiders so now I have a plan to create quite a few on various different topics! 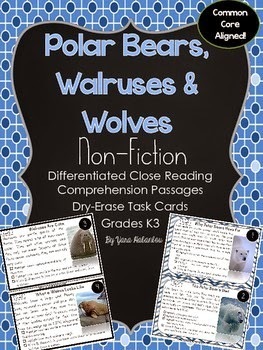 This one here includes passages about polar bears, walruses & wolves. Check out TPT The Sea of Knowledge Store, TPT ESL World, or The Sea of Knowledge Blog for more.